The year is 1932. A man dangles over the edge of the Black Canyon, about 1,000 feet in the air. He’s bet his life on the support of a few ropes holding the weight of his body, dynamite, and tools. He’s focused, but groggy from few hours of sleep inside his tent home. This is his job. His part in what is going to be the most incredible engineering wonder the world has ever seen. 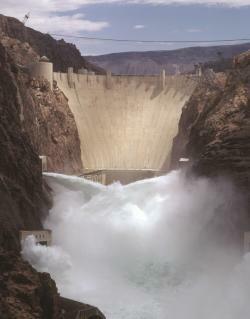 …the Hoover Dam. Sound exciting? High scalers aren’t exactly in high demand anymore. But the thrill of getting outside in Boulder City is still around. And it’s evolved into something more palatable. Not every outdoor adventure has to be as daring as scaling a canyon. (Although the mountain biking can get a little hairy if you so choose.) But there are a lot of ways to play outside in this city. 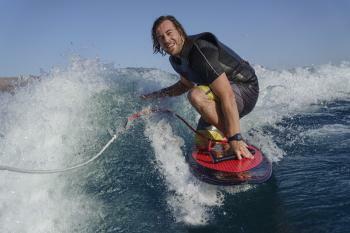 To help you decide on an activity, we’ve created the Adrenaline Scale. Pick the level of adrenaline pumping through your veins (1−10) that you’re comfortable with. And go play. It’s the reason that Boulder City exists. So, in honor of our roots, we recommend you stop here first. Looking out over the edge, you can’t help but feel the vast power of this thing. This one takes some confidence. But don’t let that deter you. If you’re a first-timer, you can take the easy trails. With a lesson, the right bike, and some safety gear, you can do it. And the views are well worth it. After the bike pump, you’ve earned your glass of wine. 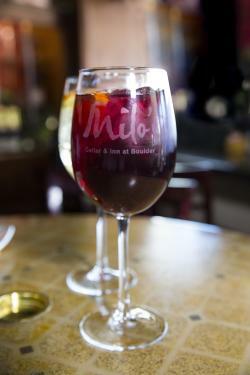 Sip and savor the city’s art, wine favorites and casual hospitality while you see Historic Downtown Boulder City. 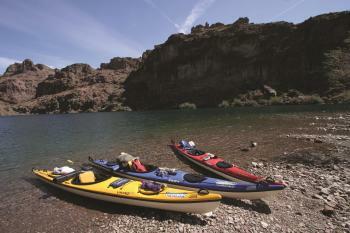 There’s so much to explore in the Colorado − rain caves, ancient rock art, wildlife, and hikes. One way to do it is with a kayak beneath you and paddles to push you forward. There are plenty of places in town that will take you on a half-day or multi-day adventure. With its rugged beginnings, Boulder City has a whole lot of history. Why not hear about it from an expert … riding around on a Segway? Grab a book, make a picnic and bring a Frisbee. You’ll be amazed to find so many parks in Boulder City where you can run around with the kiddos or play a quick round of tennis. This is a detour you should definitely take. You’ll feel in tune with the wild, whether you just drive through or stay to play, boat, swim, fish, jet ski, hike or enjoy a dinner cruise. We know we can’t compare a leisurely round of golf with a high scaler’s risky line of work, but golf is played outside. 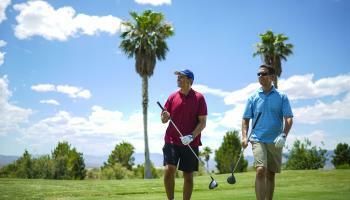 And Boulder City golf courses are some of the best. If you’re looking for a rush, go zip lining. 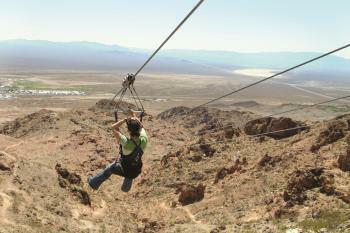 In just a harness and helmet, you’ll soar over the Mojave Desert at 60+ mph. You’ll see a lot in this three-hour experience. The Techatticup Mine is the oldest and most famous gold mine in Southern Nevada. And a really neat place to snap family photos and explore the past.